If you can believe it, we’ve just about made it through the letters of our preschool alphabet book. All 52 of them. With only a few letters left, our book is almost filled to the brim with these awesome crafts and they have made learning the letters of the alphabet for the preschooler a whole lot more fun. The uppercase letter T was no different. If you’ve got a little boy yourself, you know just how much they love all things creepy, crawly, or slimy. Anything that crawls around in the backyard is pretty much the coolest thing they’ve ever seen and taking something they might find outside and turning it into an alphabet craft is pretty much a surefire way to get them excited about learning. That is pretty much the response I got when we decided to turn the uppercase letter T into a turtle. This cute little guy is super easy to put together and makes the perfect way to practice the letter T! In fact, you can make the entire thing with just two sheets of paper. When cutting out your pieces, you’ll find that most of them are pretty basic shapes. 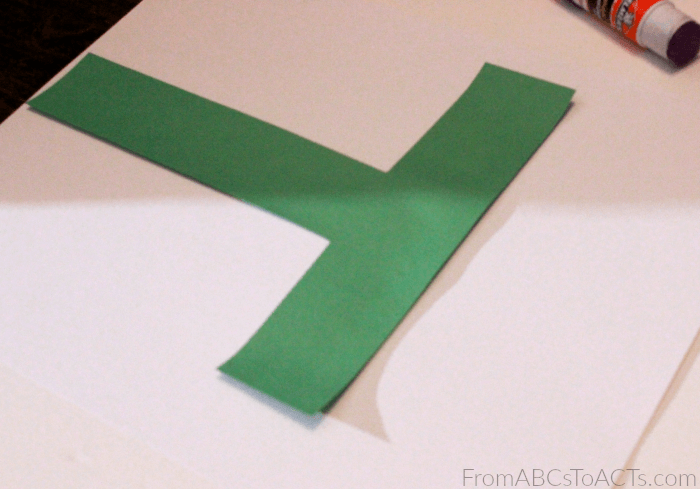 From the darker green paper, you’ll cut out the uppercase letter T and a half circle shape that is roughly the same size at its widest as the top of your letter T.
From the lighter shade of green, you’ll need a shape for the head, the tail, and both feet. You can also cut out some smaller rectangles and half circle shapes to make some patterns and variations on the shell of your turtle like a real one would have. Once all of your pieces are cut, the first thing you’re going to want to do is glue the head and the feet of your turtle onto the back of your shell so that when you flip it over, they can still be seen. To begin assembling your turtle, glue your uppercase letter T directly onto your sheet of white card stock. From there, go ahead and glue your turtle shell onto the top of your letter. It should fit right on to the top portion of the T.
All that’s left after that is adding your finishing touches! Add the tail to the backside of your turtle and stick some of those rectangular shapes all over his shell. Give him a googly eye so he can see and you’re all set! He’s ready to add to your alphabet book alongside the printable uppercase letter T page that you’ll find below.